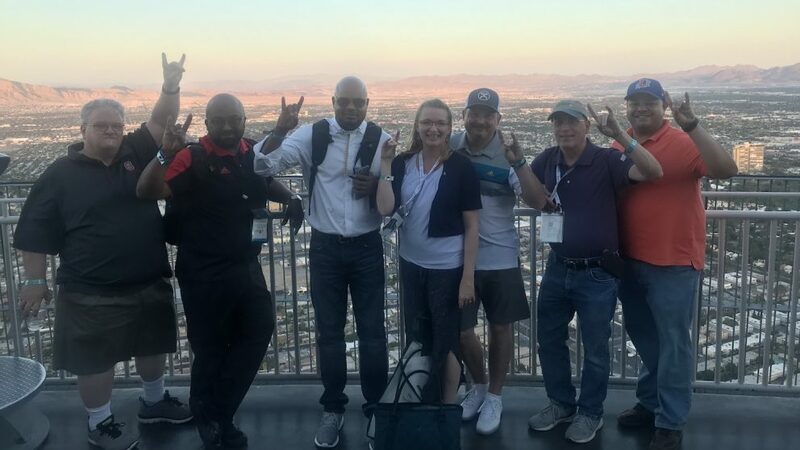 Left to right: Darren Ley, Tony Pearson, Shawn Colvin, Donna Petherbridge, Tim Hinds, Bob Klein and Brandon Pope in Las Vegas for the UBTech conference and InfoComm trade show. 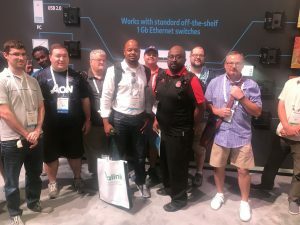 A group of DELTA staff took to Las Vegas in June to attend the 2018 UBTech conference and the InfoComm trade show produced by AVIXA™, the Audiovisual and Integrated Experience Association. The UBTech conference brings together higher education leaders and AV professionals to share insights and tech solutions. The conference also features tailored summits and various networking opportunities. “It is an opportunity to get a better understanding of how the instructional technology we use is changing and evolving so we can transform our rooms and modernize them with the changing standards accredited by the American National Standards Institute (ANSI),” said Classroom Services Manager Shawn Colvin. 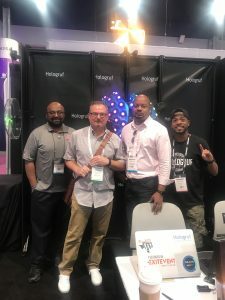 Colvin was among DELTA staff members from Video Communication Services (VCS) including Tim Hinds, Bob Klein, Darren Ley, Tony Pearson, Brandon Pope and Michael Whitman who attended the conference and trade show. Associate Vice Provost Donna Petherbridge was also in attendance. This group along with Peter Watson, Brian Dyer, Bob Pence, Larry Evans and Bob Wilkerson from the Media Production Services team attended as well. “InfoComm is the largest audiovisual (AV) trade show in the country, with nearly 40 football fields of exhibition space,” said Watson. The trade show covers all facets of video and digital production equipment. According to Watson, the UBTech Conference is held concurrently and includes access to InfoComm. “The value of attending these events is significant. It’s a confluence of technologies and expertise that helps us understand ever-changing industry standards, future technologies, trends in technologies and practical application of them, and also best practices in the current use of tech in higher education,” Watson added. Classroom Support Technician Brandon Pope completed the Classroom Technology Support (CTS) preparation course at the conference to prepare to complete the CTS exam. Left to right: Tony Pearson, Tim Hinds and Shawn Colvin pictured with a conference attendee. “The Certified Technology Specialist™ (CTS®) program is recognized worldwide as the leading AV professional credential. The CTS certification is ANSI accredited under the International Organization of Standardization (ISO) and the International Electrotechnical Commission (IEC) ISO/IEC 17024:2012 General Requirements for Bodies Operating Certification Schemes of Persons program,” said Associate Director of VCS Tony Pearson. Technology Support Technician Brandon Joyner and Pearson currently hold CTS certifications within the team. In addition, Pearson along with Colvin and Technology Support Analyst Darren Ley completed the Dante training and earned their level 1 certifications. Ley also completed the Dante level 2 certification. Pearson also took an AV design class at the conference and was the only higher education professional among a group of industry professionals. Pearson’s takeaway from this session was “when you do a needs analysis, you should listen to what people want.” It gave Pearson an opportunity to discuss real-world classroom issues with vendors and others who are in the field. Interacting directly with vendors was an important aspect of the conference for the VCS team. They are able to see a sampling of the new technologies coming soon and also receive demos to see how the products can help improve classrooms here at DELTA. From strengthening password security to ideas on how to manage production workflow, the lessons learned at the conference are impacting the MPS team. “Learning what other higher education peers are doing generates ideas for how we use our own technologies,” said Watson. A few sessions of interest for DELTA staff included various presentations on audiovisual security and systems, the women in leadership summit, the impact of virtual and augmented reality and much more. View more in-depth information on a few DELTA staff members favorite and key sessions/takeaways. “I learned so much about the technologies possible for enhancing our classrooms and enjoyed spending time with the team. What I realized with every session that I attended and every vendor I chatted with is how far ahead our MPS team is in thinking about how to design and support technology-rich spaces and how fortunate we are to have such an amazing, knowledgeable team,” said Associate Vice Provost of ATI Donna Petherbridge. Left to right: Tony Pearson, Bob Klein and Shawn Colvin at UBTech. 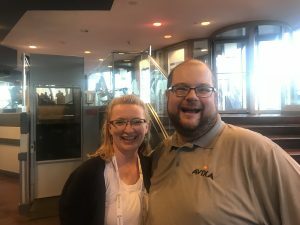 “I’ve attended Infocomm (now AVIXA) for several years now and I find that its always a great opportunity to engage AV/IT industry experts and while networking with like-minded professionals who understand and value the importance of connecting emerging technologies with higher education. AVIXA and UB Tech both provide a setting unlike any other in the AV/IT industry that gives us an opportunity to stay ahead of industry trends and gather information that we use to shape the way we think about how we can best support student success in DELTA classrooms. I think that makes us unique as a distance education provider and our faculty, particularly those coming from other institutions, recognize that and it shows in our end product.” said Classroom Services Manager Shawn Colvin. 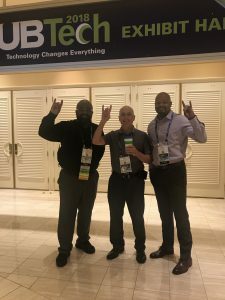 “The thing I really like about UBTech is it’s a good opportunity to see how others are using Mediasite and how our strategies and solutions relate and contrast to other institutions. This past year I found interesting topics on flipped classrooms and other teaching methods. I also learned how universities are outsourcing security; how it’s changing from locally sourced management to contracted oversight. For some institutions, it’s a more cost-effective approach. We also took a look at how closed captioning is being handled at various institutions,” said Mediasite Security Administrator Bob Wilkerson. 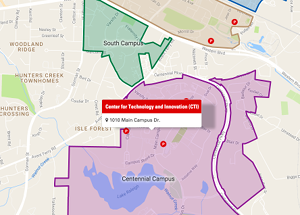 “I’ve attended conferences like this over my whole career at NC State, and it’s amazing to see how technologies have changed and evolved over time. It’s essential for us to know what people are doing and what’s on the horizon,” said Mediasite Security Administrator Larry Evans. Donna Petherbridge (left) and Michael Whitman (right) pose for a photo during conference sessions. The DELTA group pictured with conference attendees from NC State Office of Information Technology.